Capping a six-month resupply and reboost mission, Europe's third Automated Transfer Vehicle left the International Space Station on Friday, setting course for a fiery final act to collect research data and dispose of the orbiting lab's garbage. The 15.5-ton cargo capsule, nicknamed Edoardo Amaldi after a pioneering Italian physicist, undocked from the space station's Zvezda service module at 2144 GMT (5:44 p.m. EDT). Edoardo Amaldi backed away from the space station before firing rockets to leave the vicinity of the 450-ton complex. The ATV's departure was delayed three days after a communications miscue Tuesday caused officials to call off the undocking. Friday's undocking sets the stage for a four-day free flight leading to re-entry. 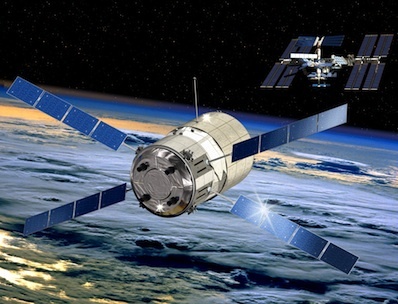 Two de-orbit burns will lower the ATV's orbit, and the spacecraft will break apart and burn up over a remote zone of the Pacific Ocean between Chile and New Zealand. Impact of the ship's debris is expected around 0127 GMT Wednesday (9:27 p.m. EDT Tuesday). Space station astronauts loaded 2,181 pounds of trash into the ATV's dry cargo compartment, and the ship's tanks hold 771 pounds of urine and waste water for disposal, according to the European Space Agency. The trash replaced more than 4,800 pounds of fresh food, clothing, crew personal items, experiments and spare parts delivered to the space station when Edoardo Amaldi arrived March 28. Nine reboosts of the space station's orbit with the ATV's thrusters raised the lab's average altitude by about 16 miles, according to ESA. A data recorder strapped inside the ATV's pressurized module is programmed to measure the conditions of the re-entry as the spacecraft crumbles and fragments in the upper atmosphere. "One of our objectives with this re-entry breakup recorder is to get some definitive data on how objects respond as they re-enter the atmosphere," said William Ailor, the device's principal investigator from the Aerospace Corp., in an interview aired on NASA Television. The recorder, embedded inside a copper shell, will log acceleration measurements, attitude rates, temperatures and pressures during the ATV's fall from space. Once it is through the harshest phase of re-entry, the recorder will relay the data back to researchers through the Iridium communications satellite system. "It's basically a cell phone with its own heat shield and its own little instrument suite," Ailor said. The device could be a template for a black box data recorder on piloted commercial spaceships. Edoardo Amaldi is the third of five ATVs built for ESA by Astrium Space Transportation. The next mission, nicknamed Albert Einstein, arrived at its French Guiana launch site earlier this month for launch in spring 2014.